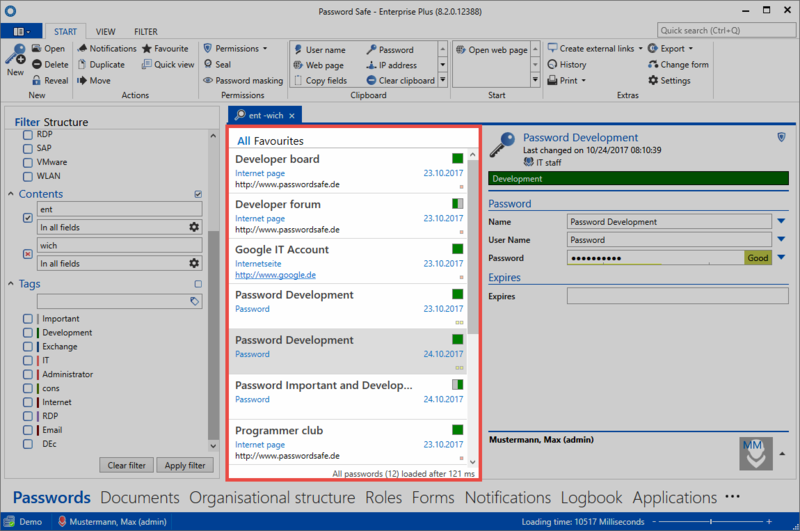 The list view is located centrally in the Password Safe client, and is a key element of daily work. There are also list views in Windows operating systems. If you click on a folder in Windows Explorer, the contents of the folder are displayed in a list view. 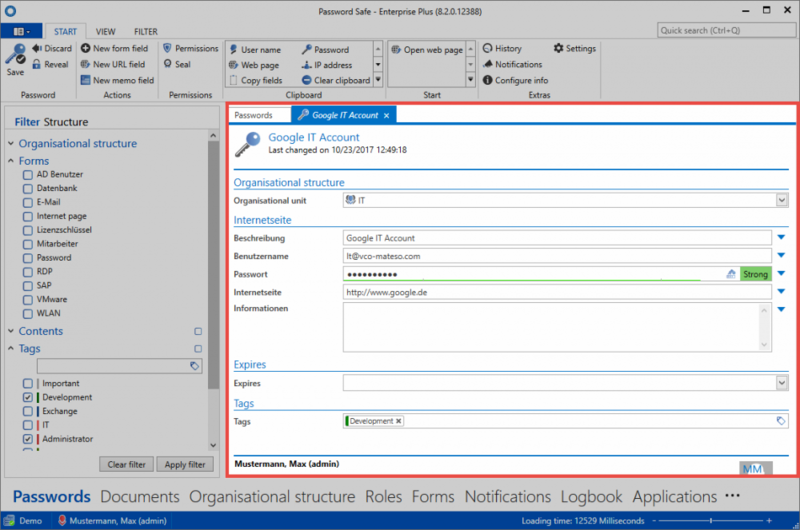 The same is true in Password Safe version 8. However, instead of folders, the content of the list view is defined by the currently applied filter. * This always means that the list view is the result of a filtered filter *. For the currently marked record in list view, all existing form fields are output to the reading pane. With the two tabs “All” and “Favourites, the filter results can be further restricted. 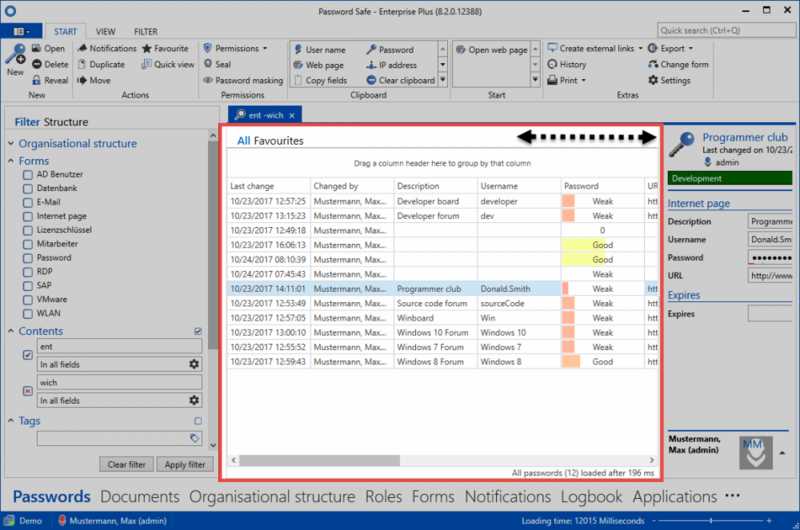 At the bottom of the list view, the number of loaded records and the time required for this are shown. *For more than 100 list elements, only the first 100 records are displayed by default. This is to prevent excessive database queries where the results are unmanageable. In this case, it makes sense to further refine the filter criteria. 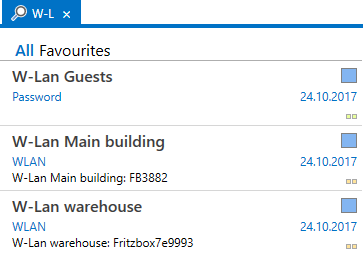 By pressing the “All” button in the header of the list view, you can still manually switch to the complete list. Through the search field, the results found by the filter can be further refined as required. After you have entered the search term, the results are automatically limited to those records which correspond to the criteria (after about half a second). The search used for the search is highlighted in yellow. Regularly used records can be marked as favourites. This process is carried out directly in the ribbon. A record marked as a favourite is indicated with a star in list view. You can filter for favourites directly in the list view. For this purpose, simply switch to the “Favourites” tab. Every record displayed in list view has multiple icons on the right. These give feedback in colour about both the password quality and the tags used. Mouseover tooltips provide more precise details. All records that correspond to the filter criteria are now displayed in list view. These can now be opened, edited, or deleted via the ribbon. 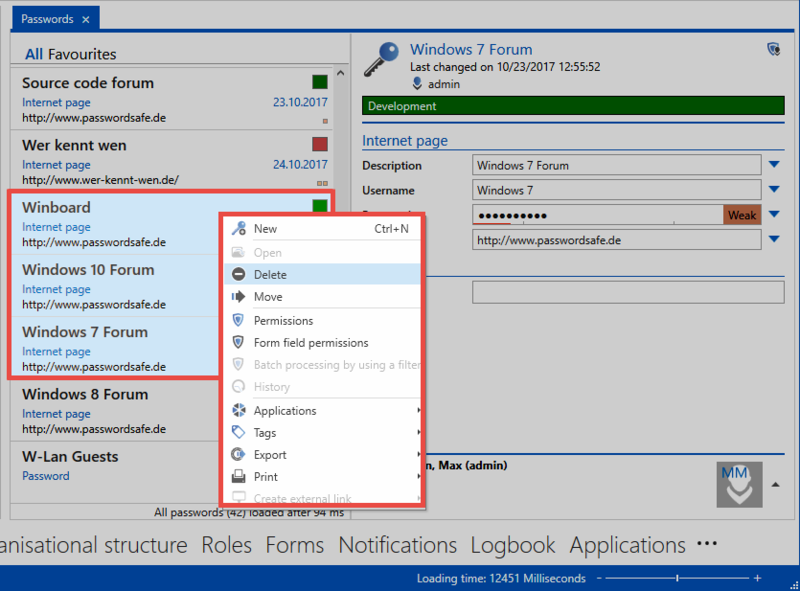 Many functions are also available directly from the context menu. You can do this by right-clicking the record. Multiple selection is also possible. To do this, simply highlight the desired objects by holding down the Ctrl key. 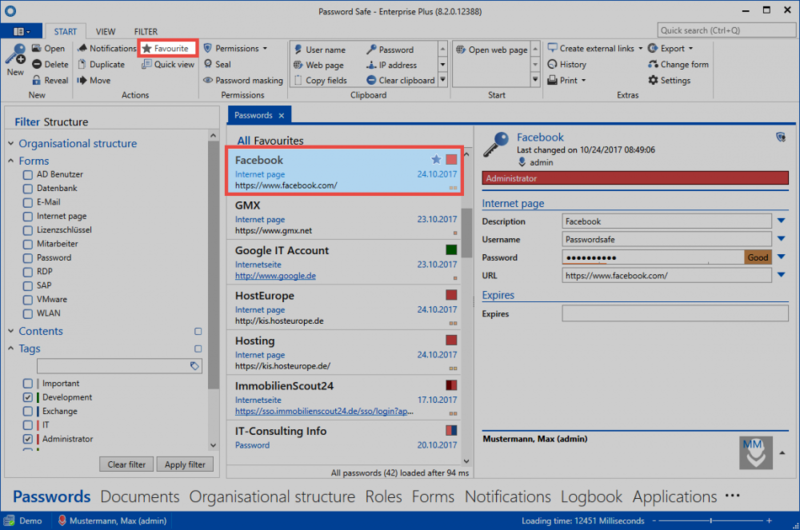 By double-clicking, as with the context menu (right mouse button), all records can be opened from the list view in a separate tab. Only in this view can you make changes. This detail view opens in a separate tab, the list view is completely hidden.